Advanced Warfighter Magazines (AWM) fill the gap between the current metal and polymer magazine designs. 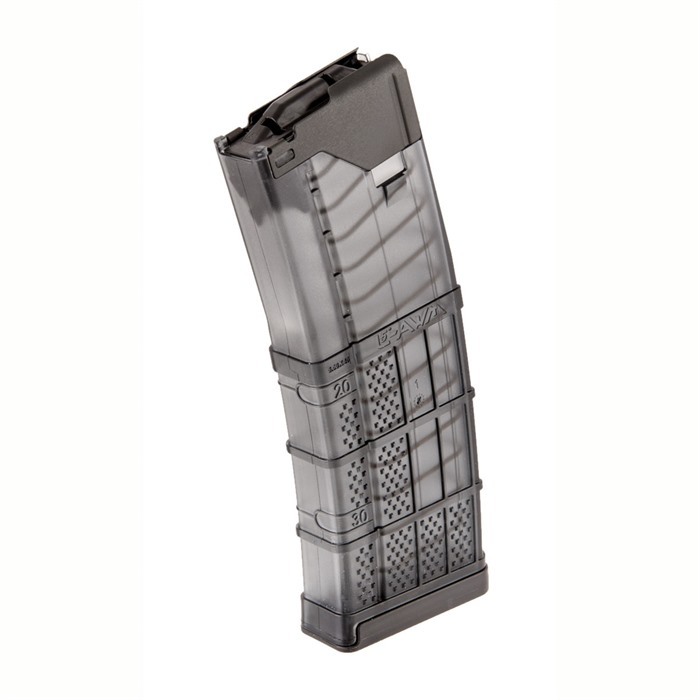 These lightweight molded polymer magazines stand up to rough handling and extreme conditions of tactical operations, including heat and impact of sustained full-auto fire. Permanently attached, wrap-around feed lips are made from a single piece of precision formed, hardened steel that is PTFE coated for corrosion resistance. They help promote smooth ammo movement and will not deform when the magazine is stored fully loaded over a long period of time. Tested to withstand temperature extremes of -50 degrees F to +180 degrees F and a 5 foot drop fully loaded, onto concrete without impairment of function. Non-reflective exterior has molded-in ridges and enhanced texturing that improve the structural strength and provide a solid grasping surface. Drops free from mil-spec magwells; load to full capacity and insert into weapons with bolt closed. 30-round model fits pouches designed for standard US-GI-spec magazines. Anti-tilt follower and constant-radius body curve helps ensure smooth, snag-free feeding. Hard polymer base plate provides a positive gripping surface for extracting mag from tight-fitting pouches and removes easily for disassembly and cleaning. Bought 5 of the AWM to use in a SIG 556 SWAT. Loading the magazine was a breeze and the ability to see round count was a plus. All magazines functioned with out any problems and the last round locked the bolt to the rear. If you want an alternative to MAGPUL try this magazine I highly recommend it. I still like Magpul Pmags, but these are even better. Sturdier feed lips, nice aggressive texture to grip, and the translucent plastic allow you to check your round count with a quick glance. Being fully transparent from all around makes it easier to see the remaining ammunition. We ran it over, dropped it on the feedlips numerous times, parked an H2 on it for 10 minutes and it still worked. I don't say this lightly: the AWM is better than a PMAG in ever single way. It's just as resilient, has stronger feed lips, can be left loaded indefinitely (read: years) with ZERO feed lip spread, slides in and out of magwells faster than PMAG (reloads are as quick as aluminum mags), and it has a true anti-tilt follower (almost as good as magpul enhanced follower and WAY better than the green milspec follower). Mag spring is VERY strong; it feels like an XP spring...great for reliability in SBRs and over-gassed carbines like Bushmaster and DPMS. I highly recommend the AWM's without reservation. I go on patrol with these. Also, these are no longer affected by DEET like the old Lancer L5's. These new lancer magazines are even smoother than the original L5's. They are so easily inserted into the mag well and there is absolutely no play in the follower. Permanent steel feedlips definitely give them an advantage over the Pmags, in my opinion. I really wanted to like these magazine. I bought both the Translucent 30 rounder, and the black 30 rounder when they first came out. The manufacturing date on my mags are 02/11 and 03/11. The feed lips are great, they're easy to load, the follower and spring both work as they should. The issue I have is that neither one locks the bolt to the rear after the last round. If I insert an empty magazine on a closed bolt, and pull the bolt back, 50% of the time it'll lock the bolt back, but once I press the bolt release and let the bolt ride home and try it again, it will not work. Same with when shooting. I went through about 200 rounds in each mag, and every time, the bolt rode home after the last round. I've heard other people haven't had this issue, but since it's happened to me in the translucent and black mag, I won't be buying anymore. Great range toys, but I'll stick with my magazines that completely work, instead of mostly work. The 20 and 30 AWM's survived the Noveske 3 gun class and Larue multigun 2012. They were used for every stage in the heat, rain, and dust of central Texas. Loved the fact that I could visually inspect the number of rounds without having to press check the mag. Monopodded off the base with no issues. Locked back consistently with my rifle. Like them better than PMAGs for overall design. Bought 8 of these. Brilliant design, lives up to all the hype. Love the hardened steel feed lips. Love the the look of my shiny brass reloads peeking through the translucent smoke polymer. For just a couple bucks more than a Pmag - totally worth it. I have been trying out a couple of these magazines for the past few years and recently bought 6 of the translucent mags for duty use. I just completed a week long LE shooting course and used these mags throughout. No malfunctions. Not one ever. This course included plenty of dirt and mud work and the magazines remained completely reliable, no matter how dirty they got. I have left one magazine loaded more or less continually for 4 years, always with the round on the right side, with no feed lip deformation or body swelling. These mags have proven to be as reliable as other polymer mags without the feedlip susceptibility/brittleness in the cold. Being from both a Military as well as Law Enforcement background, I've seen the best, as well as worst equipment. I received two prototypes from Lancer when they first came out- they are yellow in color, and are the L5 version, however, they worked!! They are still working several years later, and have been paired with my old, trusted, Bushy. The AWF Magazines have proven themselves time and again, and even though I have many mags of different types, and several ranging in capacity from 60-100 rds, if the stuff hits the rotating wind machine, it'll be my Lancer AWF mags in MY bug out bag. To the three star rater, I make an observation. As I've built, repaired, and upgraded many hundreds of these rifles, my suspicion is that it's your BCG causing the failure, not the magazine. Though some mags will work, many out of spec BCG units will act up with some mags. I also recommend checking your bolt catch, as not all are identical. In my builds are the best quality BCG's and bolt catches I can obtain within the budget. Try replacement of these critical components and you'll have the same results as everyone else. Good shooting, everyone!! its so pretty... have not shot 1 shot without a jam. Mfr Part: 999000232001 738435615000 Advanced Warfighter Magazines (AWM) fill the gap between the current metal and polymer magazine designs. 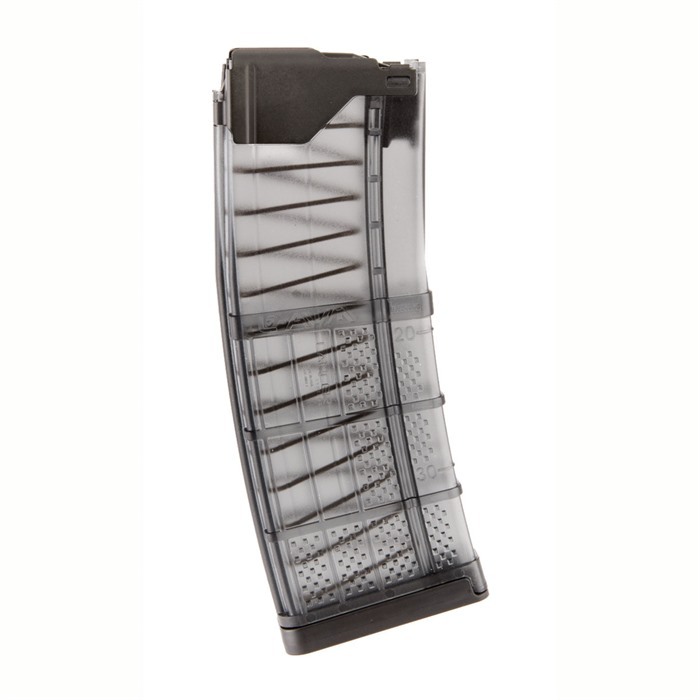 These lightweight molded polymer magazines stand up to rough handling and extreme conditions of tactical operations, including heat and impact of sustained full-auto fire. Permanently attached, wrap-around feed lips are made from a single piece of precision formed, hardened steel that is PTFE coated for corrosion resistance. They help promote smooth ammo movement and will not deform when the magazine is stored fully loaded over a long period of time. Tested to withstand temperature extremes of -50 degrees F to +180 degrees F and a 5 foot drop fully loaded, onto concrete without impairment of function. Non-reflective exterior has molded-in ridges and enhanced texturing that improve the structural strength and provide a solid grasping surface. Drops free from mil-spec magwells; load to full capacity and insert into weapons with bolt closed. 30-round model fits pouches designed for standard US-GI-spec magazines. Anti-tilt follower and constant-radius body curve helps ensure smooth, snag-free feeding. Hard polymer base plate provides a positive gripping surface for extracting mag from tight-fitting pouches and removes easily for disassembly and cleaning. AR-15 L5AWM Magazine 223/5.56 30rd Polymer Smoke Gray Advanced Warfighter Magazines (AWM) fill the gap between the current metal and polymer magazine designs. 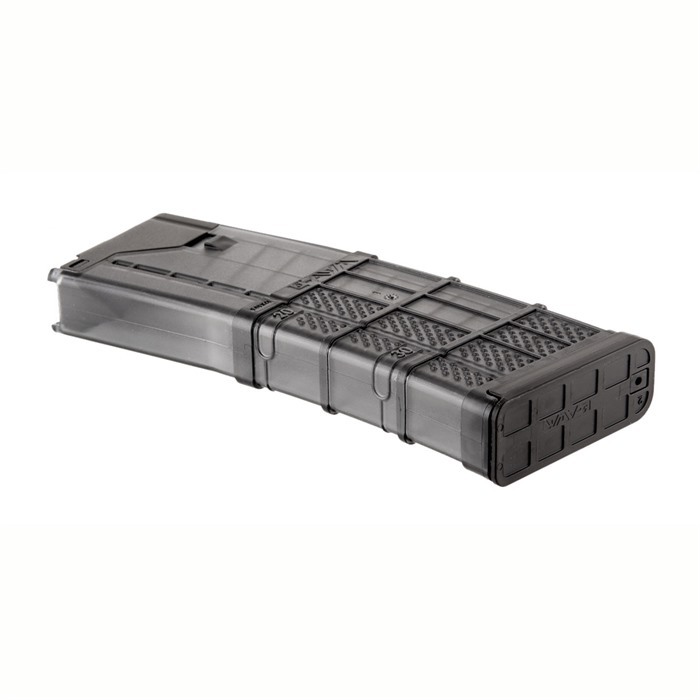 These lightweight molded polymer magazines stand up to rough handling and extreme conditions of tactical operations, including heat and impact of sustained full-auto fire. Permanently attached, wrap-around feed lips are made from a single piece of precision formed, hardened steel that is PTFE coated for corrosion resistance. They help promote smooth ammo movement and will not deform when the magazine is stored fully loaded over a long period of time. Tested to withstand temperature extremes of -50 degrees F to +180 degrees F and a 5 foot drop fully loaded, onto concrete without impairment of function. Non-reflective exterior has molded-in ridges and enhanced texturing that improve the structural strength and provide a solid grasping surface. Drops free from mil-spec magwells; load to full capacity and insert into weapons with bolt closed. 30-round model fits pouches designed for standard US-GI-spec magazines. Anti-tilt follower and constant-radius body curve helps ensure smooth, snag-free feeding. Hard polymer base plate provides a positive gripping surface for extracting mag from tight-fitting pouches and removes easily for disassembly and cleaning. 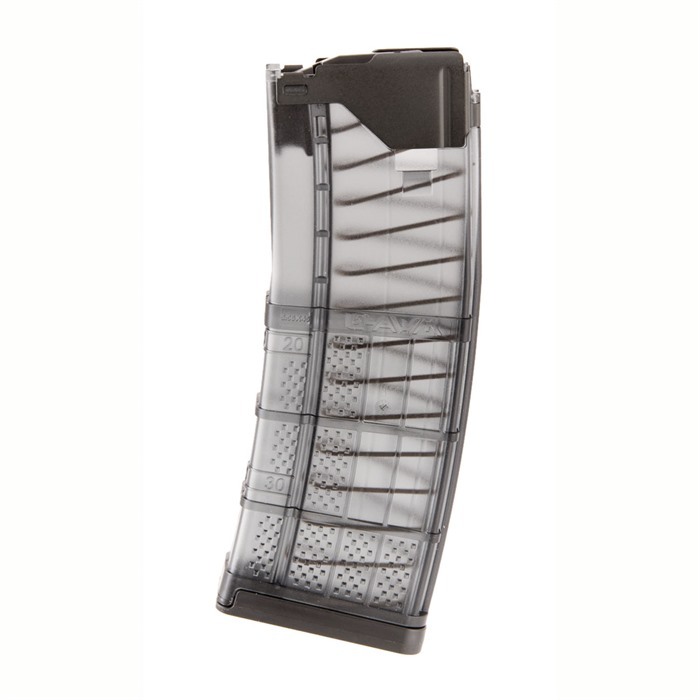 AR-15 L5AWM Magazine 223/5.56 30rd Polymer Smoke Gray 5/Pack Advanced Warfighter Magazines (AWM) fill the gap between the current metal and polymer magazine designs. 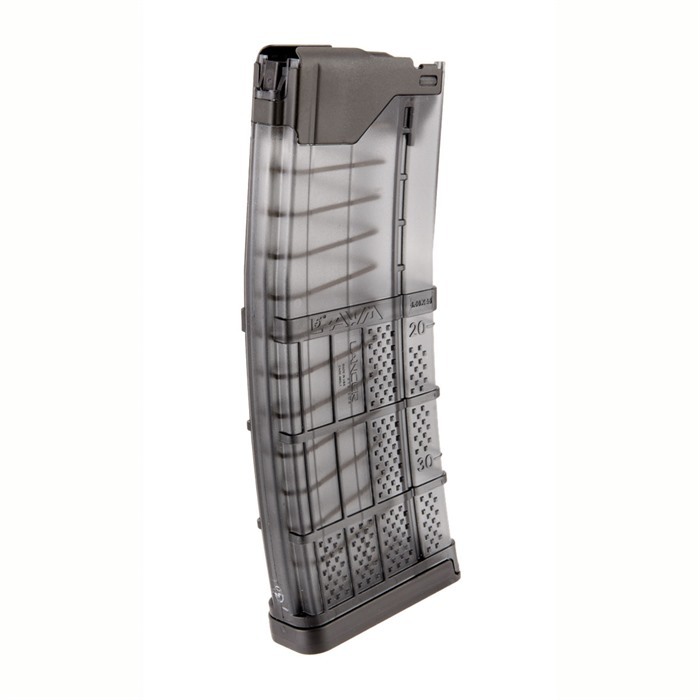 These lightweight molded polymer magazines stand up to rough handling and extreme conditions of tactical operations, including heat and impact of sustained full-auto fire. Permanently attached, wrap-around feed lips are made from a single piece of precision formed, hardened steel that is PTFE coated for corrosion resistance. They help promote smooth ammo movement and will not deform when the magazine is stored fully loaded over a long period of time. Tested to withstand temperature extremes of -50 degrees F to +180 degrees F and a 5 foot drop fully loaded, onto concrete without impairment of function. Non-reflective exterior has molded-in ridges and enhanced texturing that improve the structural strength and provide a solid grasping surface. Drops free from mil-spec magwells; load to full capacity and insert into weapons with bolt closed. 30-round model fits pouches designed for standard US-GI-spec magazines. Anti-tilt follower and constant-radius body curve helps ensure smooth, snag-free feeding. Hard polymer base plate provides a positive gripping surface for extracting mag from tight-fitting pouches and removes easily for disassembly and cleaning.